Woohoo! The 2nd Annual Cupcake and Wine Party was a success! This year we had a total of 11 adults and two children, far surpassed last year’s attendance record. Before I photobomb this post, I have to make a few confessions. The Cupcakes: I ruined 3.5 batches of cupcakes the weekend prior. I was going to spend a Saturday baking away! And I thought I was excited, but apparently my head was not in the game. 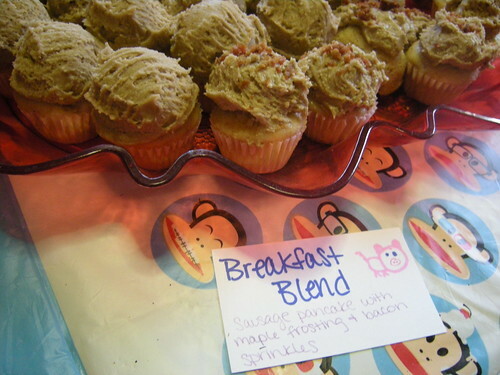 The first batch went well – these were the Breakfast Blends, which was actually made from pancake batter. The second was a box of yellow cake mix. I divided the batter in two for different flavors. There were two pans, they went in a few minutes apart. I was closely watching one of them because it had Graham cracker chunks in it and I didn’t want it to dry out. That one came out first. They seemed to be a little brown on top, but I tested one and it tasted great, so I was happy. Then the timer went off for the second pan. These were well done, like too dry and ugly to cover with frosting. WTF? I know my oven is wonky, but I’ve never ruined cupcakes like this. Then I noticed the oven was cranked to 450. Thanx Ken! So, it’s not that I leave my child unattended in the kitchen, I usually shoe him away from the stove when he gets close, but he is Ninja fast. I was using recipes from this Better Homes and Gardens cupcake book, and the recipes kept calling for “a box with pudding in the mix” so then I thought, “Hey! Let’s just make pudding and ADD it to the cake mix!” Nope. A full batch ruined. Then I made a batch of perfectly fine Chocolate cupcakes! It was getting to be mid-afternoon now. I didn’t want to run to the store again, so being the awesome baker that I am, I decided to stop being lazy and make a freaking cake from scratch. I have done it before, I promise. So I did! And then I took the first pan of cupcakes out of the oven and realized something was off. They hadn’t risen. I FORGOT THE BAKING POWDER. And of course I already had the next pan(s) in their cupcake papers already. Oh, I should also mention that I doubled this batch of made-from-scratch cake? And the next morning, I went to the store and bought two more boxes of cake mix. I made them exactly as the directions stated, didn’t even sub buttermilk for water. Frosting: None of my frostings turned out the way I wanted them. They were delicious tasting, but not the correct consistency. The chocolate was too runny, so it wouldn’t hold it’s shape. Peanut Butter, Maple and Marshmallows were all too thick to pipe from a zip-bag, so I had to use the cookie/ice cream scoop for those. Oh, and I killed my hand-mixer while making the chocolate frosting. Like, dunzo, needs to be tossed, killed it. Cake: Pancake batter, plus some brown sugar. I had half a box of whole wheat mix and some Heart Smart Bisquick. 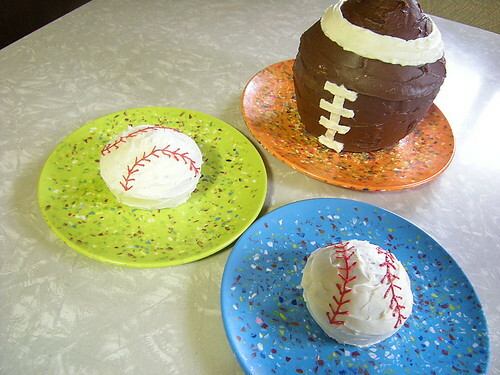 The batter wasn’t sweet enough on it’s own. Also in the cake was delicious Farmland Pork and Bacon Sausage (look in your freezer section), cook it, drain it, add it to the batter. This was my favorite 🙂 If you’re into the Almond Joy candy bar at all, this one is for you. Cake: Chocolate, regular chocolate cake mix. Each is filled with Almond Joy filling, which is just coconut and sweet and condensed milk (more coconut than SACM, you just need enough to coat the coconut). Once the batter is in the cupcake pan, add a tablespoon (or two, or three) of the coconut/sweet and condensed milk mixture and bake as normal. The coconut will brown on top just a little. I feel like I’ve unlocked a secret baking badge with this. Homemade Almond Joys??? Cake: Chocolate Cake mix. Use Super Strong Coffee instead of water. I brewed my strongest K-cup (Revv) plus added 3 tbs of instant coffee. Pretty sure I added a couple more tbs of instant coffee to the batter after I initially mixed it up. Oddly enough, it didn’t have a strong coffee flavor when baked. I was disappointed, I didn’t follow a recipe because I wanted mine super strong. These were also a little slice of heaven. Cake: Yellow cake, mixed and baked as normal. 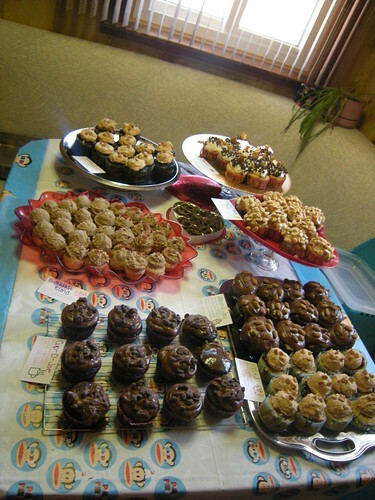 Once cooked and cooled, I scooped out a half tablespoon or teaspoon of cake from each cupcake. Before frosting, add a heaping tablespoon of caramel to the hole. Caramel: you could use ice cream topping or whatever, but I had an extra can of Sweet and Condensed Milk, so I cooked it in my 2qt slow cooker on low overnight, creating perfect caramel goodness. 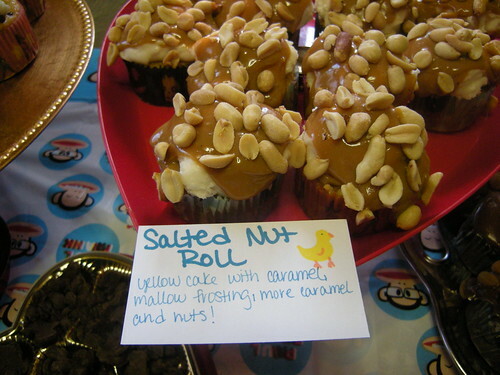 Frosting: Marshmallow (mallow cream, butter/marg, milk, powdered sugar, baby mallows), topped with caramel and salted nuts. This is a messy one! Cake: Yellow cake, mixed and baked as normal. Just like the Salted Nut Roll, once cut and cooled, scoop out a small chunk of the cake to create a lake for the jelly. 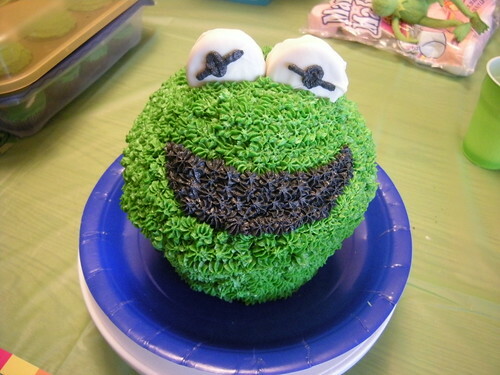 I used good ‘ol grape jelly for this, squeeze it in the hole (thatswhatshesaid), cover with frosting. Cake: Yellow cake, with chocolate chips and Graham Cracker chunks baked in. Watch your baking times, the grahams will dry out the cake batter. 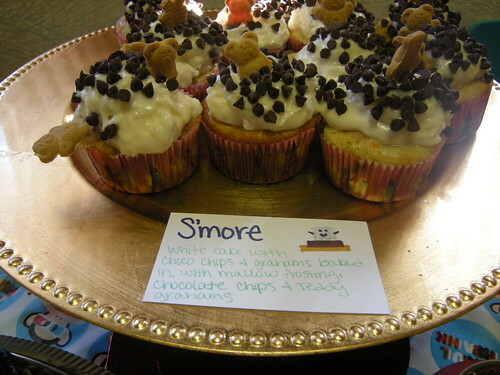 Frosting: Marshmallow (mallow cream, butter/marg, milk, powdered sugar, baby mallows), topped with chocolate chips and Teddy Grahams. Cake: Chocolate, with peanut butter chips. I love cupcakes. I know they are kinda cliche now and way overexposed, but I still love them. You cannot deny how delicious they are. 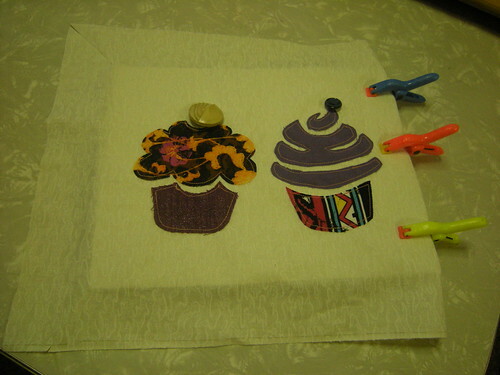 So, I was on a mission to make something cupcake themed to hang on a wall. I don’t have any canvas, or giant pieces of wood, so painting was out. I also didn’t want to sew fabric on fabric and expect it to hold it’s shape. 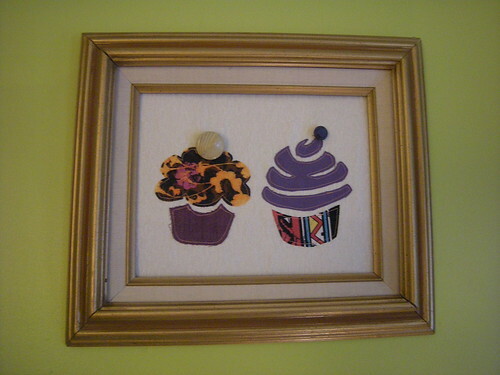 The final idea was to sew on fabric, attach to cardboard and frame. Step 1: Assemble the necessary items. The important about this project for me, was to use stuff I already have on hand. 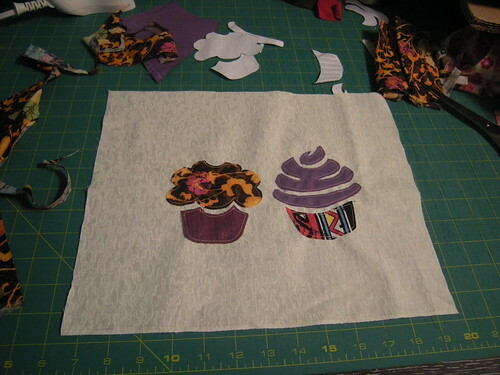 I spent some time in my scrap box trying to find top and bottom cupcake pieces that all matched, but weren’t too matchy matchy. B. Pin to background fabric. Note: there are only three pieces in this photo, not four. 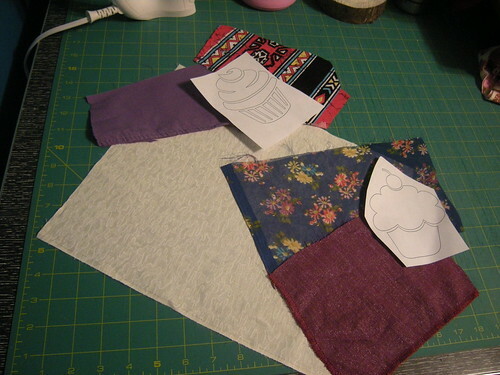 I decided to try and tackle the hardest fabric last – so I took this photo before I sewed that one on. And then of course I switched fabrics to something easier to work with. Not much to explain here! 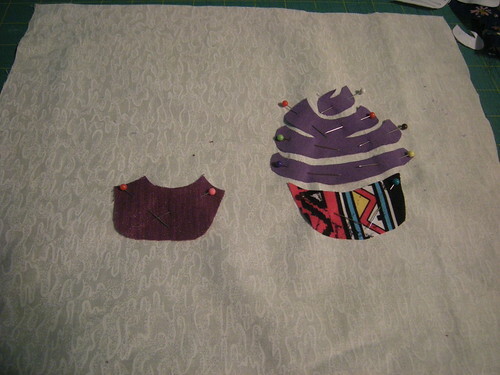 As you’ll see in the final photos, I have sewed one button to the top of each cupcake. 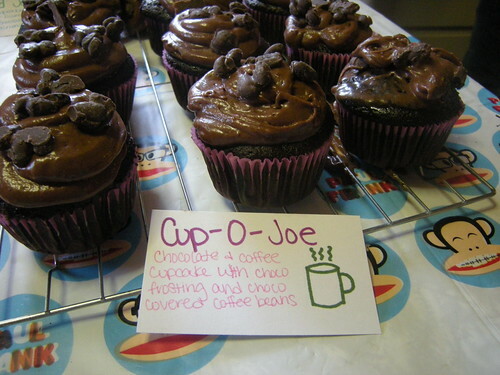 No cupcake is complete without something on top – a cherry, coffee beans, sprinkles, SOMETHING! I opted to hot glue my fabric right to the cardboard. To be honest, I was going to staple it out of sheer laziness, but the cardboard was too thin. This was much trickier than I thought it would be. Once I got my fabric centered, I clipped the fabric to the cardboard on one side, so that I could pull the other side kinda sorta tight, but not too tight. Also tricky with giant buttons. 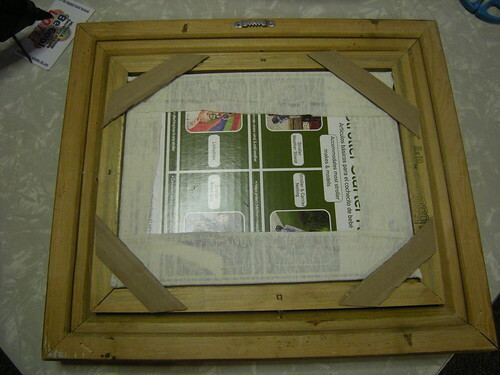 This step also includes attaching the photo to the frame, if you chose to. I went the route of more cardboard, but attached it so that it could be removed with minimal damage to the frame if necessary. I finally found the key ingredient in delicious homemade frosting: Cream Cheese. After weeks of thinking and recipe Googling, I decided on my flavors. First things first, need to lessen the holiday baking stash. Get rid of all cake mixes and candies. 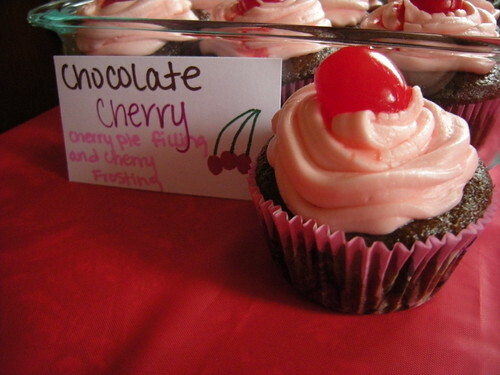 The first batch I made was Chocolate Cherry. I used a recipe found here. Didn’t quite follow all the steps. The cupcakes were delish, but I’d either use only half of the cherry pie mix, or run it through my food processor before mixing with the batter. The heavy cherries just sank to the bottom of the paper. 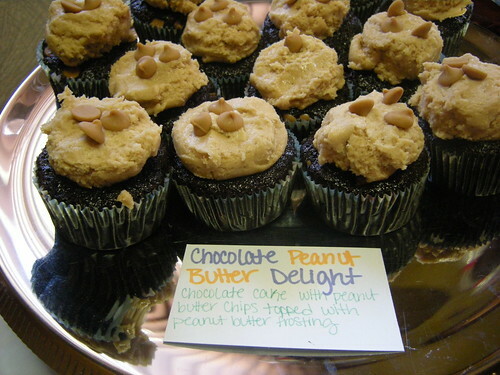 This recipe alone made like 36 cupcakes. If you like this flavor combo, I highly recommend. Yum! 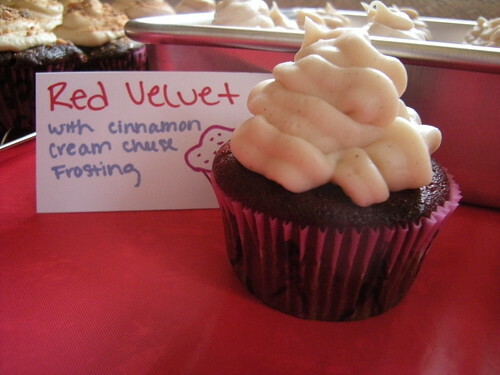 Red Velvet was great! Recipe here. Deliciousness all around, follow the recipe as-is. 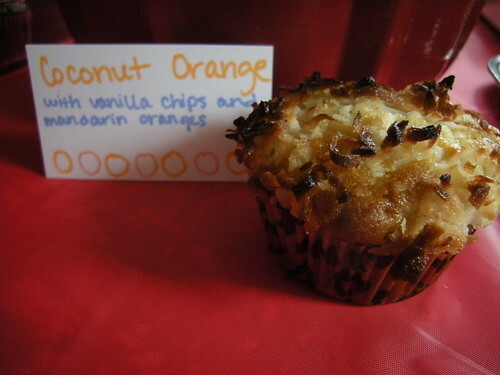 I found this recipe by accident, and I love mandarin oranges AND coconut, so it seemed like a win-win. I made this one with my Mom in mind because she was coming to my party and she doesn’t care for chocolate. These would be absolutely perfect as a breakfast muffin. My complaints are small – 2/3 cup of oil was way too much. The PAN was greasy when I took the cupcakes out. Cut back to 1/3. Run the oranges through the food processor. Don’t mind the burnt coconut, that’s the work of my lovely oven. The oven that I still haven’t mastered after a year and using it every week. 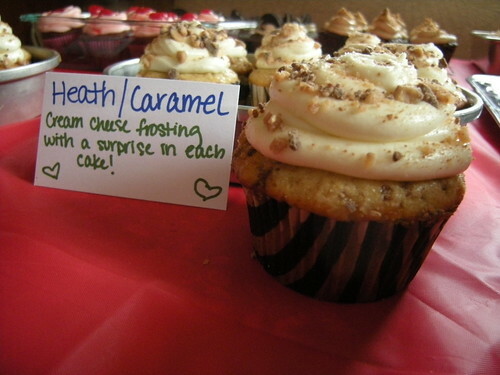 The other cupcakes were candy-bar themed. 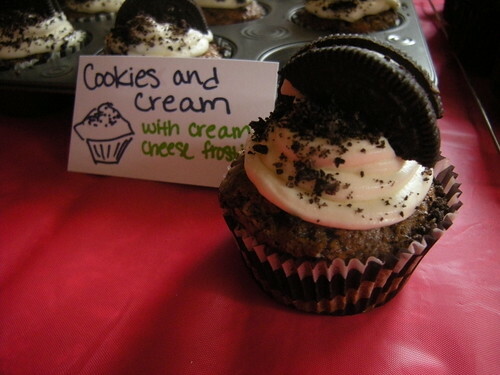 I used a vanilla cake mix and divided the batter into two, Heath for one half and Cookies and Cream for the other. The Heath were kinda fails. I put at least a cup of Heath bar in the cake batter. Halfway through cooking, I dropped a caramel into each cupcake. Thats where the fail comes along. The caramels were just sticky, hard and annoying. Cookies and Cream also a failure. The crushed Oreo crumbles dried out the cupcake batter, so even tho I cooked these the correct time, they were still way way way dry and burnt. Both of these cupcakes had plain Cream Cheese frosting. Mix room temp cream cheese and butter until smooth. Add powdered sugar accordingly. Add vanilla. Taste. Add more powdered sugar if you need a thicker mixture. Mix til you think it tastes great. This is a big mixture for tall frosting, aka drowning the cupcake in frosting, as it should be. You do not need any fancy schmancy cake decorating tools. I *tried* to use my reusable bag for one of the batches, was a total failure. It wasn’t Wilton’s but the bag was busting at the seams and seemed like the frosting was seeping through the fabric (word to the wise, dont buy cake decorating sets from Ikea). So, for the rest of them I just used gallon sized freezer bags. Worked great, less mess. 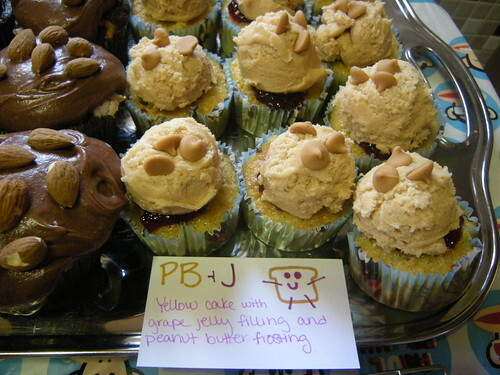 The last two had peanut butter themes – so take the above frosting mixture and add peanut butter. Start with half a cup. Add accordingly. 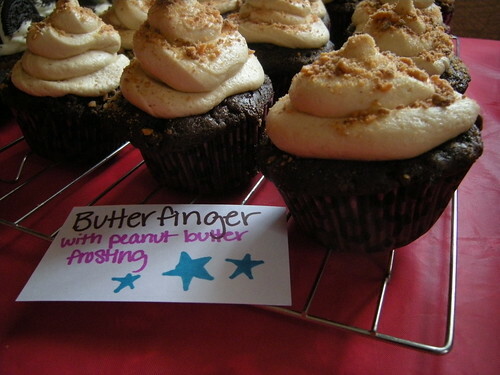 I mixed like a cup or two of crushed Butterfinger into the batter. Cook. No complaints. I saved these for last because they were by far my favorite. 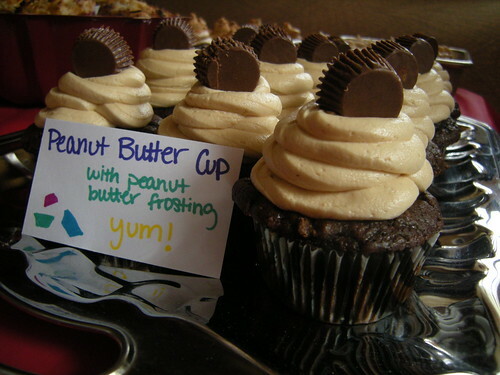 I saved out 12 whole PB cups to top the cupcakes. The remaining were ran through the food processor and mixed into the batter. So there you have it. Please don’t eat your computer screen. Have your (cup)Cake and eat it too! Part 1. There is a small business credit card commercial that I used to hear all the time. About a woman who started a cupcake and wine bar. I thought the concept was genius, and on the spot decided I wanted to do the same in the form of a party. So this has been on my mind for like 6 months. 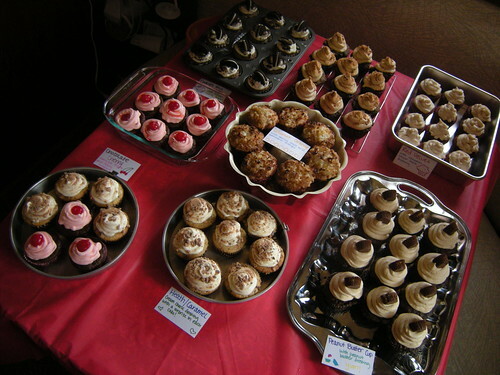 What better way to drown the winter blues than with 7 different types of cupcakes? First of all, I needed some decor. I didn’t want to go all out, but found a super cute idea online that took cupcake papers and styrofoam balls and made cupcakes. So I did just that! As I was buying the ingredients, I found out how expensive styrofoam was. So I only bought a 6-pack and hoped that I would find something else of the same size to use for more. I’m cheap. I stopped at Michaels later and they had some leftover Christmas decor – including plan, 3 inch not-heavy, not-sure-what-they-are-made-of Christmas balls (bulbs). On clearance for like a quarter each. They were great for painting. Also glued sequins to a bunch as well. 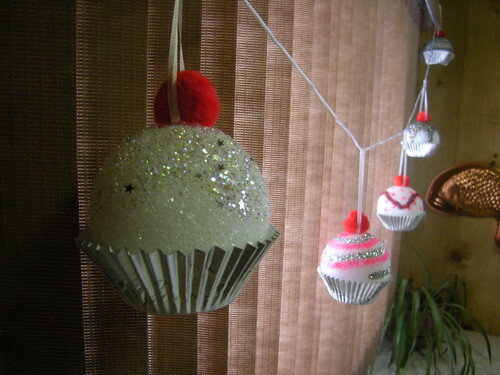 The original idea called for these to be made into Christmas ornaments, but I wanted garland. So I secured the loop under the pom-pom, and tied that on another piece of string. If I had to do-over, I think I’d stick to styrofoam. It was so much faster to slap on some glue (ok, I used ModPodge for the glitter) rather than hot glue individual sequins. I think I just liked the styrofoam ones better. I love these, but can’t help but think that they look more like ice cream cones than cupcakes. 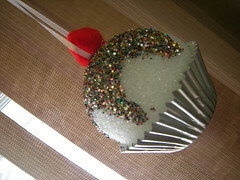 Glue the ball to the bottom of the cupcake wrapper. I used hot glue. 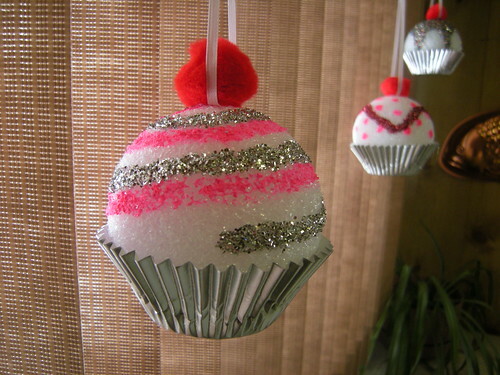 Decorate the ball. I brushed on the glue, then poured the glitter over. I was kinda leery about glitter on Styrofoam, but the excess shakes right off. Cut your ribbon, if you want it to hang. Like 5 inches? Fold in half, glue to top of ball, add a dab of more glue and add the pom-pom. 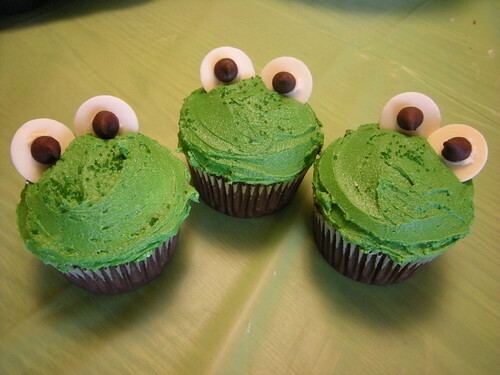 I don’t want this post to get TOO long, so I’ll leave you with a glimpse of the edible cupcakes. I’ll post recipes and more detailed pics soon. First, lets go back to the beginning of the month! My friend Debbie and I made Easter Basket Cupcakes! 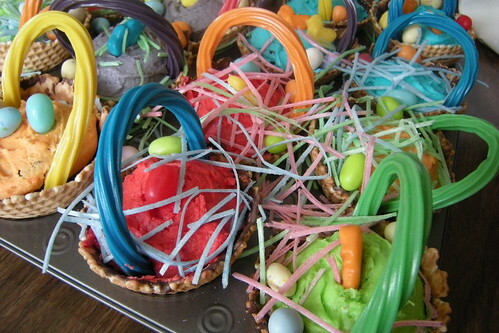 These are cupcakes in waffle cones, frosted, with Easter candy! Cupcakes were baked in a cupcake pan, not in the waffle bowls (makes the waffle bowl soggy and fall apart) I had read somewhere about mixing a package of Kool-Aid with frosting – instant color and flavor. So we tried it and it was AWESOME. I think the correct ratio is 1 package of Kool-Aid to 1 can of frosting. We made our own frosting (made by my mom!) and added the Kool-Aid. The flavor was awesome! It was a little tart, but really fun. Interesting enough, none of the kids liked the frosting, but the adults did! 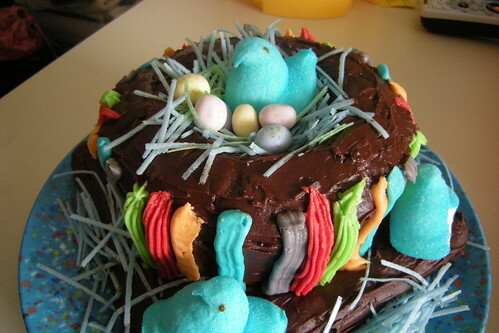 The frosting dried too fast, so by the time we got to decorating, the candy and edible grass didn’t stick. 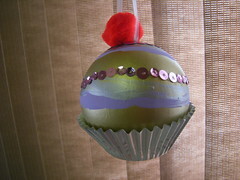 This one is the bottom of the Big Top Cupcake and supposed to look like an Easter Basket. Baking night took forever, so I forgot to add a handle. But I thought the Peeps were super cute sitting around the basket. This cake was a hit as well! I have to admit – I haven’t been crafting. Like, at all. 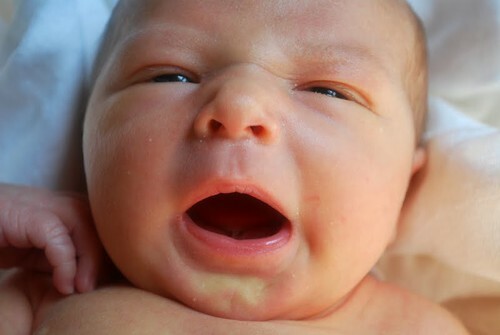 Did you know that growing a baby really wears you out? At this time last year, I was training for a 20k – running 7-8 mile practice runs and kickboxing every other day. 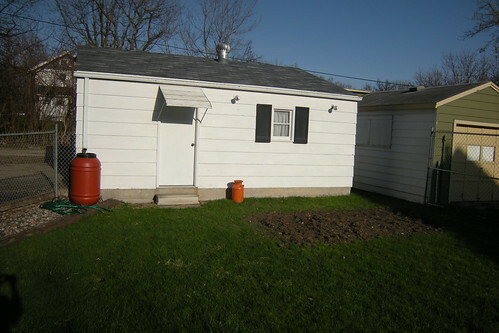 My dad and I planted hostas and asparagus on Saturday, and considered that my workout. Funny how things change (have no fear – I’ll WILL be running the Dam to Dam 20k in 2011!)! So, crafting no – but gardening and housework! We painted my living room a few weeks ago – pics to come! And my parents have been helping us get our first garden going. 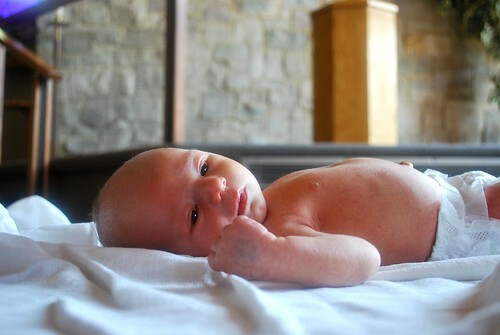 Pretty cute huh? That was the original garden. It has now doubled in size because apparently plants need a lot of space! And we just keep wanting more fresh vegetables. So far, we’ve got potatoes, onions and asparagus. Also, hosta plants. 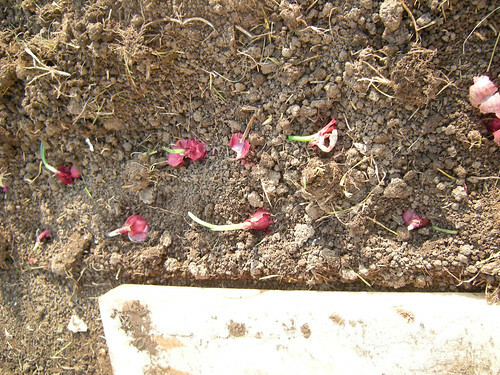 And last but not least, onions, the BEST thing in the garden 🙂 And yes, I covered them and watered them after the photoshoot. Normally I don’t buy books, but when I was browsing through it I found wayyyyyy too many inspiring projects. So I bought it. Even Brian has gone through it like 3 times and keeps finding new favorite projects for me to make. 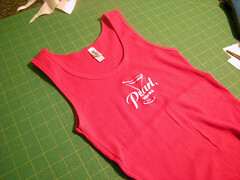 Very excited to start cutting up some t-shirts soon! This is my latest maternity top. I’m so excited about this! The white fabric is from one of my husband’s old work shirts. Again, I added an extra four or so inches on each size to accommodate my growing belly. This should last through the end of May! Unlike the one I made two weeks ago, I added the pocket back on to this one. I do apologize that you don’t get the full effect of a maternity top on a mannequin – but at least I know it will look acceptable post-baby. That is why the ruffles. Ok, working in radio had a few perks – free crap shirts. Mostly t-shirts, but I scored a few tank tops along the way as well. This particular red beauty is one of those ribbed tanks that only looks good on you if you have 3% body fat and you’re petite. I’ve never worn it. Since I want to wear this tunic to work, this… logo was just not working for me. Funny how you cannot get this iron-on stuff off when you need/want it gone. 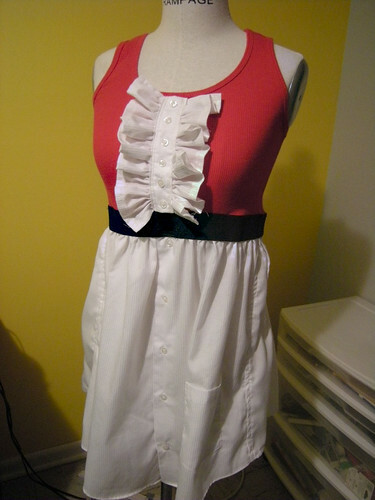 So, I opted to cover it with ruffles. Knits are funny, I had another ruffle design in mind, but with the way the fabric stretches just didn’t make sense. I’m pretty excited to wear this. Yay spring! This tunic was this weekend’s project – last weekend I made a football cake with my Big Top Cupcake pans, as well as two baseball cupcakes. Michelle’s twins turned one this week, and she wanted extra messy cakes for photos. The football is half white and half chocolate, filled with vanilla filling. 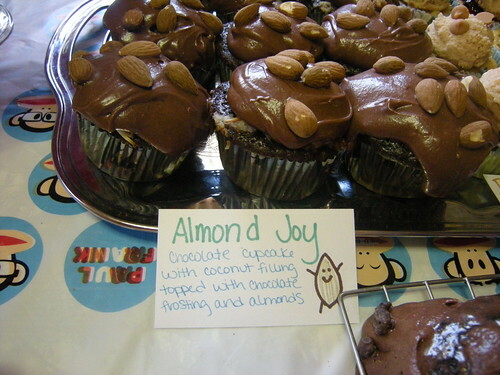 The cupcakes are chocolate, filled with chocolate filling. Delicious! I cannot tell you how much I love my Big Top Cupcake pans. Even Brian, who doesn’t eat cake, suggests ideas for cakes. This next one was his idea: Pot of Gold cake! I used the BTC bottom with the filling insert (it creates a dip in the cake, where you would put filling etc), then used the remaining batter in a regular 8in pan. 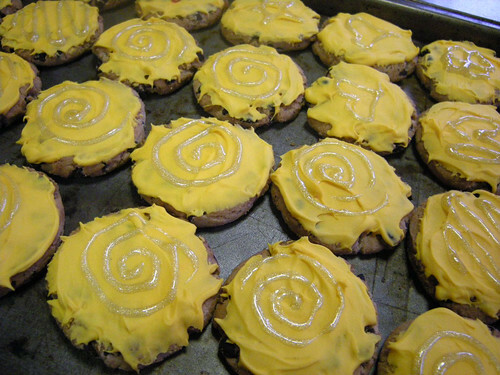 For gold, I used chocolate chips cookies and frosted them with yellow frosting. That wasn’t going to be enough, they needed to have some sort of “gold coin” lure to them. Michaels had an excellent selection of cake embellishments – I thought about using one of those powders, but then I found a clear/gold/glitter gel that was perfect for detailing. The tip was a bit bigger than I was hoping, but I put fun swirls on each cookie. 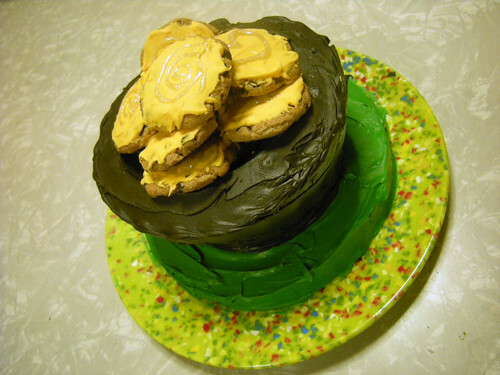 Unlike buttercream, the gel never dried, so it was kinda weird to stack them together. But it tasted delicious still. A slightly closer look! Nice and sparkly!